This photo was taken on April 14, 2017 at 1:15 PM. The location was on Capital Hill in Washington DC about 3 blocks from the Capital Building. The "Take It!" came from having walked by this shadow formation on my way to an address, and having its imprint on my mind for some reason, which called for me to return and take this almost delicate image to share. 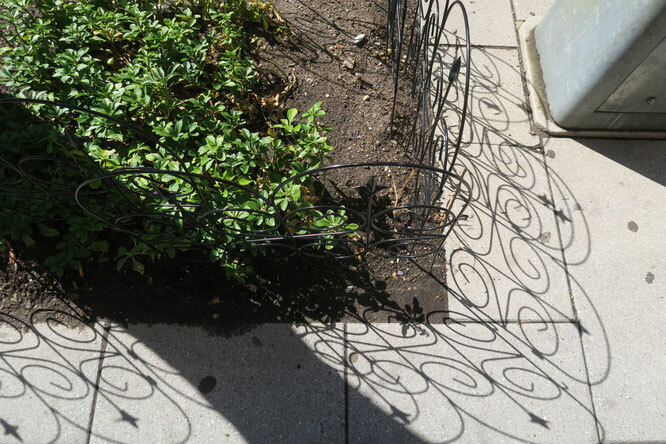 The lace like shadow cast through a short keep out of the planter fence, at the base of a big tree in the sidewalk, was a softening of the earth, and concrete which were its partners in lending their effects. The After Take: This photo is a candidate for the "Soothing Shadows" Category. Many in this section come upon us by surprise, and others are seen in advance, and become a sort of anticipitory savoring as one walks up to engage in them. This involvement can sometimes take on the form of fitting one's self into a shadow cast by an overhead something such as an overhang from a building or a branch from a tree with a cluster of leaves that makes a patch of shade. If the fit into this shade stamp is large enough there may even be a touch of temperature drop from the blocking of a hot sun. I often marvel when approaching a crosswalk on a hot sunny day in seeing what is usually an older person standing some feet back from the intersection curb, under the welcoming shade of a tree until the light changes and they take the few steps that separated them from the curbs edge, and the punishingly hot sun in which it was bathed. I enjoy joining them and complementing them on their opting for this minute bit of self preservation. My comment does not really call for a verbal response, but always seems to bring a knowing look, or nod of the head, of the recipient. The small stuff can sometimes get delightfully large. Oh how funny that you did this! We were buying some garden liners just this past weekend and I was looking at them and partially basing my decision on how their shadow would look. They look like bicycles on a bike rack. Its a very Victorian era design. I like it. I have a gate that is oh so similar to those. Its much bigger but it looks almost exactly the same. I wonder if they got them at Home Depot, that is where I got mine.